A Wadsworth Atheneum Museum of Art Wedding is a truly unique event. The Wadsworth Atheneum is an art museum located in Hartford, Connecticut. It is noted for its collections of European Baroque art, French and American Impressionist paintings, Hudson River School landscapes, modernist masterpieces and contemporary works, as well as collections of early American furniture and decorative arts. While the venue is not currently hosting weddings at this time, it has held some wonderful events in the past. 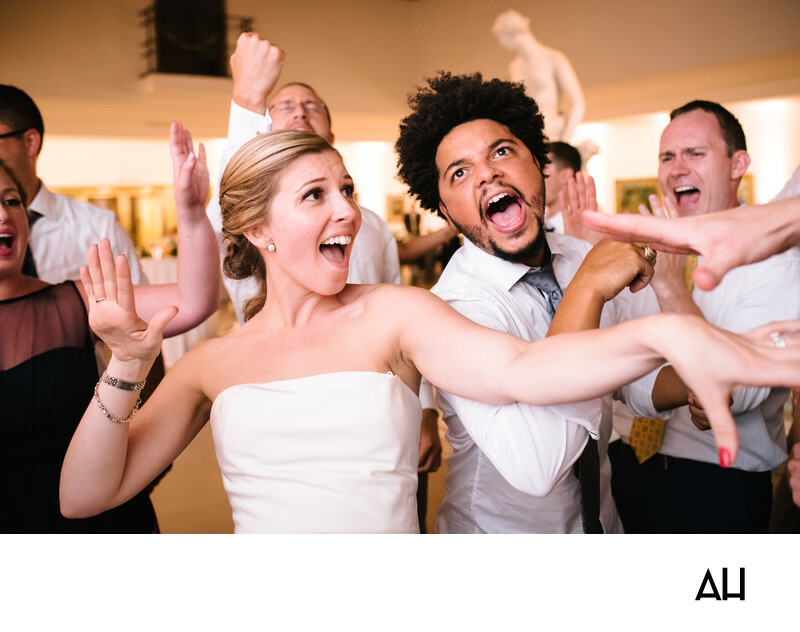 This picture, taken at a Wadsworth Atheneum Museum of Art Wedding, was filled with dancing, laughter, and a lot of love. The wedding reception took place in the museum’s Avery Court. Avery Court is the first international style space in an American museum and features a skylight and a superb fountain sculpture. The sculpture, which can be see in the background of this image, is entitled Venus with Nymph and Satyr. The piece was originally made in the 1600s for a garden in Florence by the Mannerist sculptor Pietro Francavilla, but now it sits in the museum’s court as the Connecticut sun shines on it from the skylight above. Weddings held in the Avery Court are surrounded by beautiful art and a pristine, open space. This image shows the bride and guests dancing in the court, fully enjoying the merriment of the reception. The bride and friends of the couple belt out the words to the song that vibrates throughout the room, moving to the beat of the music. The moment captures the fun-filled essence of the wedding, in a venue that provides an exceptional setting.